The least interesting pub on an Egham 'crawl'. Short walk from station, right in the middle of the pedestrianised town centre, short and boring food menu, and a selection of mainly run-of-the-mill ales. Sport on all the TVs, and very poor quality toilets. It seems this pubs management needs serious appraisal of which way it intends to market. Either it wants to be a sports pub or offer top end pub catering. If catering is their priority then please employ staff not dressed in dirty jeans and t shirts serving food between screens showing various football games. The high street desperately needs a good pub so please do not get it wrong. Pub has been renovated well . Bar staff friendly. Need to control rowdy guys who think they own the place, saw 6 people walk out last Friday because of them. At last the High street has got a decent pub back, after shambles of last management. Have visited only a few times since re-opening and overall impressed. Very friendly staff and good selection of beers and lagers. My only complaint is the claustrophobic feeling because of low ceilings and rather cramped area away from bar. Another feature of the pub, proudly announced, it would not be a sports pub - football would be shown but with no volume. Last week when I entered, football was being shown with full volume - I hope they have not reversed on that decision so soon. Overall full compliments to the present management and will continue to support the pub and wish it all success. 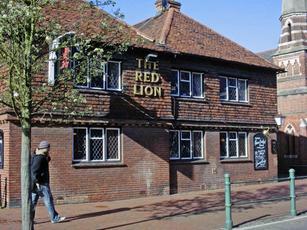 This place is having a huge refurb, should be open mid-march according to their twitter page (@redlionegham). 6 rotating cask ales and a range of craft beers/ciders. That along with a fresh food menu, I'm excited by this as I've just moved to the area and the other pubs locally are not for me. Poor ale choice and food from a packet are not my idea of good quality. New management has a lot to live up to. Good luck, I'll report back once I've sampled their wares!